"a sparkling blend of wit and illusion..."
Table magic and walkabout magic for dinners, birthdays, weddings, parties, trade shows, and more ... Magic Circle member Johnny Oxford will make your party or event truly memorable. Like many of the UK's top entertainers, Bracknell magician Johnny Oxford studied at Oxford University before training in performance in London. He is very proud to be an Associate of The Inner Magic Circle with Silver Star and a Member of the Council of The Magic Circle. Many, many thanks for providing such a high quality performance to our guests at my 40th Party last night. We all had a lovely time, enhanced by your entertainment, which wowed so many! Many people also said to me what a lovely guy (very cheerful!) you were, so thank you for adding to the ambience. Bracknell magician Johnny Oxford is very adaptable: For example, recently he was the magician at a 60th birthday party for 8 guests in a private room at a leading London restaurant, as well as being a trade show magician at London Olympia using close-up magic and humour to draw people to an exhibition stand and link them up with the sales team. These are just examples from the last few days. 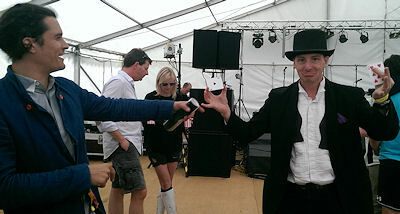 Johnny also works as a magician at large parties (loads of 40th, 50th, 60th birthday celebrations), as a wedding magician, a magician at balls, dinners and at many community events. Johnny Oxford's speciality is as a comedy magician. He creates an instant rapport with guests and combines witty patter with stunning, mind blowing tricks. Magic takes place in your guests' hands and right before their eyes! Whilst he is based in the South East and works a lot as a magician in Bracknell and the surrounding area, Johnny regularly travels all over the South East, London and the Midlands - wherever his unique brand of magical entertainment and comedy is required! Close up Magician with Cabaret Option! On many occasions Johnny combines close up magic with a cabaret slot involving a magical escape act and maybe even some dangerous juggling! As well as working as a solo magician, Johnny Oxford also runs an entertainment and party agency and knows many of the country's top magicians. So, if you need a team of magicians, or if Johnny is not available himself, then he can always arrange a magician or magicians to fit your requirements. Looking for a children's magician? Bracknell magician Johnny Oxford works as an adult magician but he can also adopt his alternative persona Juggling John to work as a children's magician and children's entertainer.